Triple Glazed French Doors Bring the Outside In. Doors are an indispensable part of your home décor and security. They not only add charm and elegance to your home but also play a vital role in bringing the outside in, joining the rooms, connecting the outdoors with indoors and securing your home and its valuable assets. Hence, while choosing doors for your lovely home you must look out for the best choices available. Well, Advanced Group is specialized in providing a wide range of elegant and classic doors that can hike the entire look and security of your home. Triple glazed French doors are the latest and the best among their offerings to the residents of Scotland. Have a peek into the huge collection and striking features of Advanced’s Triple glazed French doors and know why they are the best option for your home. The Advanced Group comes with the latest and advanced technology of triple glazed French doors having triple glazed energy efficient panels. The best thing about these doors is that they are specially designed to trim down the energy usage of your home thus decreasing the expenditure required for heating. These doors are highly beneficial for the residents of the house as 94% of the heat loss is lessened along with 70% reduction in the rate of condensation. Triple Glazed French Doors Bring the Outside In. As such, the triple glazed French doors have a vital impact on the thermal performance of your home which in turn brings down the energy consumption and its cost drastically. Being a factory production of Advanced Group, these doors excel in their quality and material. Moreover, the French doors are built keeping in mind the needs and requirements of the clients so that they can proudly flaunt the beauty of these doors to their visitors. They can easily choose their preferable ones from the wide range of UPVC colours, glasses and styles that complement their home the best. Coming with 70+ advanced and latest security features, these doors also provide the best security to your home. The security and strength of the triple glazed French doors are increased in comparison to double glazing French doors by providing them triple glazing safety measures with tougher and stronger glasses and frames. 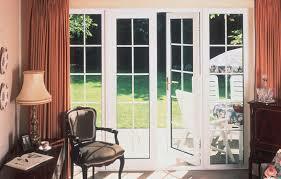 The Advanced Group’s Triple glazed French doors are largely renowned among the residents of Scotland for their quality. You needn’t to worry about the durability and longevity of these doors as Advanced Group has a long and successful history of offering triple glazing home décor products to the residents of Scotland for more than 22 years. Along with that they are also providing a guarantee of 10 long years with each and every triple glazing French door while purchasing. These doors strictly follow all the technical criteria of Building Standards and Regulations and thus are considered to be the best in the home improvement industry. Moreover, there is no headache of advance or extra payment for the customers as the quoted price by the manufacturer is the genuine buying price for the purchasers. Advanced’s triple glazing French doors are the smartest choice for the residents of Scotland as they not only beautify their home but give them a peaceful sleep by offering the strongest security ever. On purchasing these doors in a reasonable price you are getting a full package for your home that covers both its aesthetics and security. Hence, it can be rightly said that these Triple Glazed French Doors not only bring the outside in but are truly worthy of their costs.